« RVers Boot Camp – 59th Escapade – Tucson, Az. Let’s get ready to have some fun! Escapade is returning to the sunny southwest city of Tucson, Arizona. 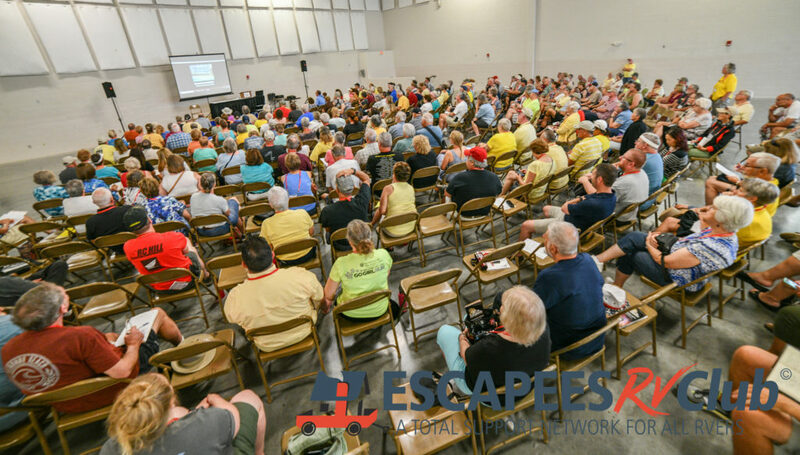 Escapade, our national rally is the largest and most extensive gathering of the Escapee community. It’s a fantastic way to learn more about the RV lifestyle from professionals, as well as from experienced RVers, all while having an amazing time! Escapade packs a wide variety of seminars, social gatherings, nightly entertainment and much more into five, fun-filled days. Tucson is a culturally rich city, steeped in true “Old West” tradition. Arizona is a virtual playground, with vast acres of unspoiled desert awaiting your exploration. With approximately 350 days of sunshine yearly, Tucson promises a warm Southwest welcome to Escapees RV Club and Escapade attendees. Make plans now to join your friends and fellow Escapee members at Escapade. Discover more ways to enjoy the freedom of the open road. Experience for yourself what Freedom Driven is all about! Not an Escapees Member? No worries! Everyone is welcome to join the fun at Escapade! Register Early! The Pima County Fairgrounds hosts the 59th Escapade; full-hook-up sites (at least 30-amp electric, water, and sewer), as well as 30-amp electric/water sites, will go FAST and availability of each is limited, so make your reservation early to insure your choice of amenities is available. Boondocking sites are almost limitless. For registration and parking options, click the button below or call 936-327-8873.